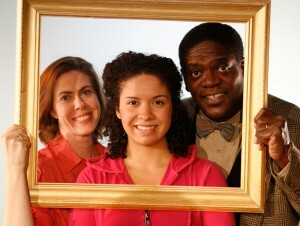 The young actors Lori Tishfield and Tory Bullock steal the show. Ms. Tishfield’s portrayal of Melody Patterson, a confused teenager of a mixed-race family, underscores the need for love, acceptance, and belonging that we all search for. Her honest performance is matched by the sweet naiveté of Tory Bullock as Jim Crow, Jr. Jim does not want to follow in his father’s footsteps as a performer, but becomes more comfortable as he develops a relationship with Melody. If the name Jim Crow seems familiar, it is. The neighbors that have moved in next to the Patterson’s are a family of performers that put on a minstrel show using the stereotypical characters that have been around since the 1830’s. The Crows always wear blackface whether they are onstage or off, but despite these masks that have been created they are comfortable in their own skin and compose a loving family that is very attractive to Melody. Topsy Crow, played by Japonica Brown, is the most fully developed of all of the Crows. Although she performs a minstrel act like the rest of her family, she tells the audience that she is going to add her own touches to it. Her performance embraces the African-American past, its present, and its future. Although Mammy most likely would not allow her to leave the show, Topsy is truly her own person and is not letting her stereotype drag her down. Mammy, played by Valerie Stephens, provides the love, strength, and stability her family needs to remain together. She creates a warm household of acceptance that appeals to Melody and Jean Patterson. Despite the overflowing warmth, the Crow family does not attract Richard Patterson. Played by Johnny Lee Davenport, Richard is a “self-made-man” who has rejected his heritage to succeed in the “white man’s world”. This fragile world of self-denial is threatened when the Crows move in. He does not want to acknowledge any familiarity with them. Richard’s hatred of his past eventually tears his family apart and leaves him with nothing but his past. Johnny Lee Davenport’s portrayal does not do the character justice. His emotions are false and I would question whether this is a stylistic choice or not if I had not seen him in Vengeance is the Lord’s recently; he refuses to show the audience his struggle and therefore leaves himself and his character in an easily disposable shell with no lifeforce. Zip Crow (Equiano Mosieri) offers a foil to Richard–or perhaps even more, offers what Richard has cast off to become successful. He provides the catalyst for Richard’s life to fall apart and for Richard to confront his past. He also provides insight into Jean who fell in love with most of the qualities Richard now denies and Zip possesses. Jean Patterson, played by Christine Power, welcomes the Crows tentatively at first, but with growing intensity as her husband refuses to face the race issue and isolates himself from the world around. With the assistance of Zip Crow, Jean begins to question the safe middle class life her husband has made for her family. While her question of whether she loves Richard because he is a black man or loves Richard and he just happens to be black might appear to be over-analysis of a small detail, it is an important thread in a family that does not address the race question. Jean is a loveable character and it is easy to see through Zip why she fell in love with Richard; it is also easy to see through Zip why she no longer loves Richard. Christine Power’s ebullient personality carries her performance farther than it should. She does not emotionally move beyond the slightly scattered hippy and create any depth for her character. This is more forgivable, however, next to Davenport’s Richard. Neighbors knocks you down and turns your world inside out. It meets racism, gender, and class bias with their own weapons: words. It’s a painful journey that makes you sit for a few minutes after and as “who do I think I am” and forces you to acknowledge all of who you are. If you are a Richard, who does not want to go that deep, this is not the show for you; but, if you have the courage to uncover and embrace all aspects (good and bad) within yourself, this play is an amazing, provocative, haunting, yet beautiful ride worth taking. 1/15/11. TNETG. This entry was posted in Comedy, Drama and tagged 2011, African-American, Boston, Branden Jacob-Jenkins, Class, Company One, Controversial, Dark Comedy, Identity, January, Japonica Brown, Jesse Tolbert, Jim Crow, Lori Tishfield, MA, Minstrel, mixed family, Neighbors, Race, Valerie Stephens by beccackidwell. Bookmark the permalink.